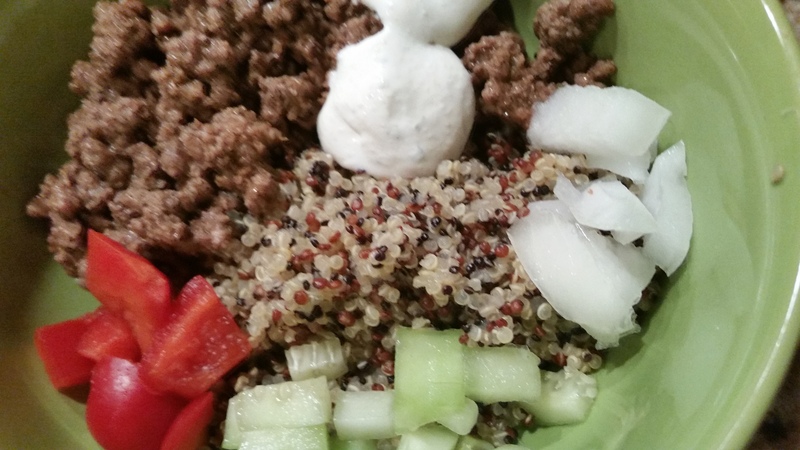 Ground Beef Shawarma Quinoa Bowl – What's for Dinner Moms? With all the parties this month I know we are going to over do the cookies, appetizers, and candy. I wanted to make something that felt kind of healthy and that wasn’t too heavy. My family loves shawarma and I had ground beef thawing for dinner. I decided to twist the usual beef shawarma by making it with ground beef and making it into a quinoa bowl. My family loved this meal! 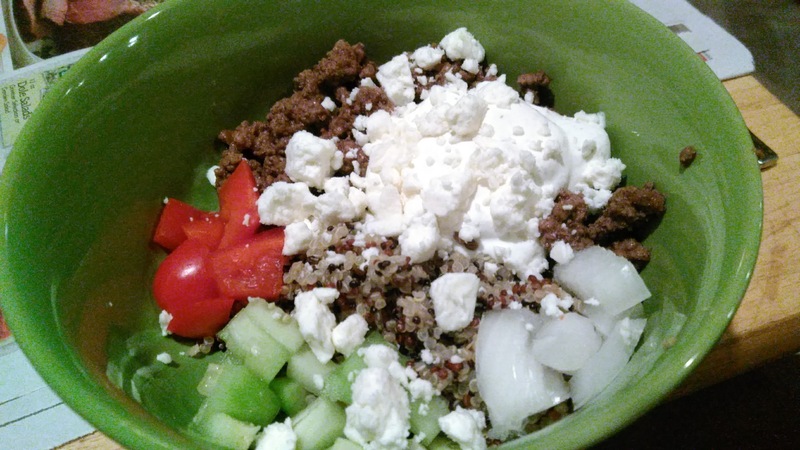 It had tons of flavor from the ground beef shawarma, a bit of crunch from the veggies, a nice chewy texture from the tri-colored quinoa, a bit of creamy from the garlic sauce and salty from the feta. It was amazing! Make spice mix in a small bowl that can be sealed or a small zip top bag. Mix well and set aside. In a second bowl mix sour cream (or plain Greek yogurt) with dill weed, garlic powder and a dash of salt, to your liking. Cover and refrigerate until serving. In a large skillet over medium heat begin browning the ground beef, breaking it into small pieces as it cooks. Begin boiling the quinoa according to package directions. Once ground beef is fully cooked remove any grease from the pan. Add 1/2 cup of water and about 1/2 of the spice mix. You may wish to add a bit less and taste and add more to your liking. Allow to simmer over medium heat until water evaporates. Remove pan from heat. Serve warm quinoa in a bowl topped with spiced meat, cucumber, red pepper, onion and drizzle of sour cream mixture and a bit of feta cheese. That’s definitely something I like! This sounds so good and full of amazing flavors! Thank you! It did have lots of great flavors and textures. Well,i have nominated you for “One Lovely Blog Award”.I hope you’ll enjoy that. Don’t forget to check the links below and follow the steps in order to accept it. I’m looking forward to you ensure and your post related to the award. Although I’ve never heard of Shawarma, the photo alone had my taste buds jumping..
You need to try shawarma sometime. We had some in Schwamsburg the other weekend. Chicken or Beef with a mixture of spices. Yummm. Hi and Happy St Patrick’s Day. This would be very healthy and yummy. Thank you for sharing. Thank you! Happy St. Patrick’s Day to you!